A unique telephoto lens for smooth, natural focus effects in foreground and background. 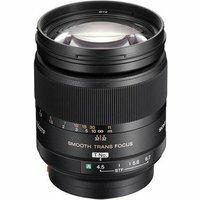 This advanced STF (Smooth Transition Focus) telephoto lens incorporates an apodization optical element that distributes light rays to create smooth, aesthetically pleasing out-of-focus backgrounds that make sharp-focus subjects stand out more vividly. Mounted on the Sony® a (alpha) DSLR-A100 camera, this lens provides a 200mm focal length (35mm equivalent).